The Scrapbook Layouts on this page are all layouts waiting on photos. These were done using the StoryTellers Club Kits from August and September 2009. 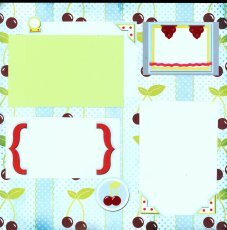 These scrapbook layouts above were made with the 12x12 Double Sided Pattern Paper called You are My Sunshine. 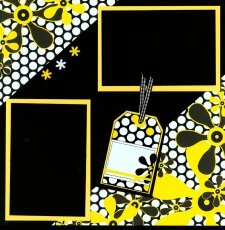 I had several sets of photos to use these with and I added black and yellow cardstock from my stash to stretch the 4 pieces of patterned paper to 6 layouts. For the layout on the left, I cut a 12 x 12 patterned sheet down to 11 x 11. Then I made 4 cuts 1 inch in from the edge all the way around, to get the 1 inch wide border of the patterned paper. For the layout on the right, I used the 10 x 10 square of patterned paper and a border strip from the die cut sheets and tags and journaling blocks. 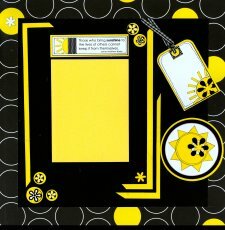 The Black and White Checked Ribbon and the Yellow and White Daisy Brads were part of the embellishments that came in the kit. For the scrapbook layout on the left, I cut the corners off one of the patterned sheets and used the center part of the paper to place at a diagonal. For the right side, I used that 1 inch border strip from the first layouts to frame the outside of the page. 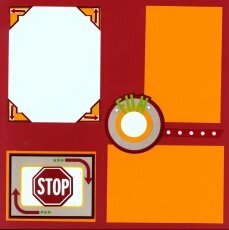 The yellow strips were left over borders from the die cut pages, and I used them to frame the photo matte. The rest of the items were photo mattes cut from yellow cardstock from my stash, the journaling blocks, tags, ribbons and daisy brads from the kit were used to complete the pages. 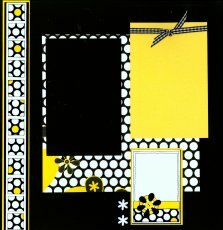 For the layout on the left, I used the 2 corners cut off in the layouts above and made double photo mattes from the yellow and black cardstock from my stash. 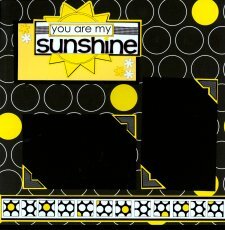 For the right side, I used the border strip from the die cuts, and double matted the "You are my Sunshine" Journaling block on yellow and black cardstock and added 5 Daisy Brads to balance it out. The black photo mattes are accented with the photo corners from the kit. 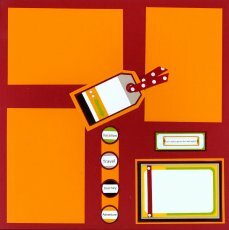 The rest of the items from the kit were the journaling blocks, tags, ribbons and daisy brads. 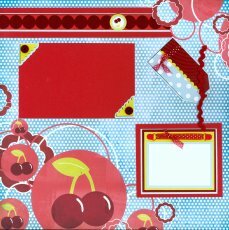 These layouts above were made with the 12x12 Double Sided Pattern Paper called Cherry Jubilee. The solid papers from Bazzill came in the kit as well and included 2 Sheets of 12 x 12 Textured Cardstock called Limeaid and 2 sheets of the white 12 x 12 Textured Cardstock called Salt. The rest of the items were die cuts from the kit. 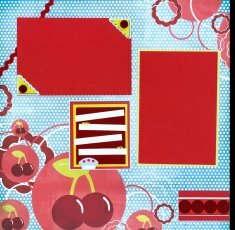 Two more layouts using the other side of the Cherries Jubliee printed papers and more of the coordinated Bazzill 12 x 12 Textured Cardstock in Lava (Red). The rest of the items were die cuts from the kit. I had one border strip that I wanted to use on both pages, so I added it to the top of the left page and used a craft knife to cut the background paper along the edge of the design, and slipped the border strip underneath the cut edge. The other portion of the border strip was used on the bottom right page to anchor the two pages together. 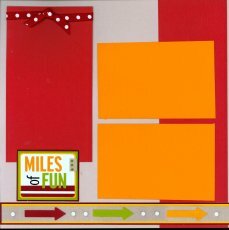 For these two layouts of Road Trip, I used the solid 12 x 12 sheets of Bazzill in Lava (Red) and the 12x12 Textured Cardstock in Orange Juice. 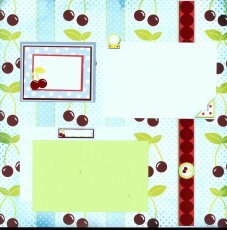 No patterned papers were used here, just the embellishment die cuts provided in the kit. 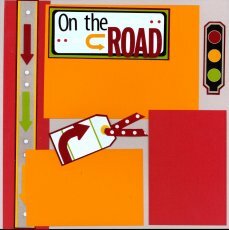 For these two layouts of Road Trip, I used the solid 12 x 12 sheets of Bazzill in Lava (Red) and 12x12 Textured Cardstock in Orange Juice on top of one of the Gray Sheets of 12x12 Textured Cardstock called New Youk. Again, No patterned papers were used here, just the embellishment die cuts provided in the kit. 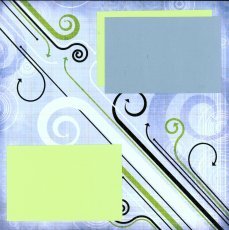 For these two Scrapbook Layouts above, I use the 12x12 Double Sided Pattern Paper called Road Trip, accented with photo mattes from the 2 Sheets of 12x12 Textured Cardstock called Limeade and the 2 Sheets of 12x12 Textured Light Blue Cardstock called Windy. The rest of the Layout items were die cuts from the kit. 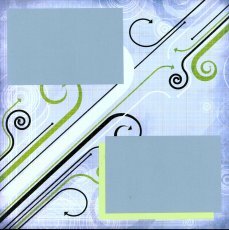 For these two above, I use the 12x12 Double Sided Pattern Paper called Tough Stuff, accented with photo mattes from the 2 Sheets of 12x12 Textured Cardstock called Limeade. The rest of the items were die cuts from the kit.